The medieval port town of Poole is situated next to the sea and is full of tourist attractions and activities, such as its famous pottery and Poole Park. 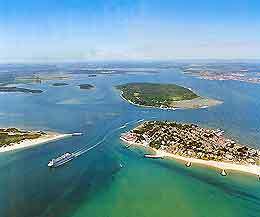 These appealing sights also include Poole Harbour and the Sandbanks peninsula, with excellent facilities for boating and water sports - including both windsurfing and jet skiing, a number of highly-acclaimed restaurants and cafés, many historic 18-century buildings, and some excellent waterfront hotels. Poole is also one of the most popular areas in the south-west of England for fishing and deep-sea fishing, and mackerel-fishing trips regularly depart from the harbourfront itself. Set just back from the Quayside is the High Street, where a plethora of shopping opportunities present themselves. The Poole Tourist Information Centre (TIC) is also to be found on the High Street, being open on a daily basis and the best place to make tourism related enquiries. There are a wide variety of hotels and accommodation available in the centre, close to Poole Quay and the surrounding area, making this friendly and lively Dorset seaside resort an accessible holiday destination for travellers and families. If nightlife is an important part of your holiday, then consider looking for hotels next door, in the neighbouring town of Bournemouth, which is only a matter on minutes away and stands next to Boscombe and Christchurch. Dorset beaches are amongst some of the finest in England and are often referred to as the 'Florida Keys of British beaches'. There are more than 5 km / 3 miles of golden beaches in Poole, and these are popular with both tourists and locals in the area. 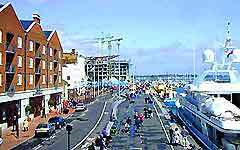 Poole Quay is one of the most vibrant areas in the town and has an exciting, friendly vibe. Attractions at the Quay include numerous restaurants, cafés, bars and public houses - many with excellent views of the harbour; yachts, boats, water sports and the renowned Poole Pottery. There are also regular events and gatherings throughout the year at the Quayside. Poole also has a number of excellent museums and art galleries in and around the town, providing interesting information about this region of the Dorset coast. Some of the major museums here include the Poole Waterfront Museum - situated next to the Quayside and home to the Local History Centre; the Scaplen's Court Museum - with a fragrant walled herb garden and displays of many interesting exhibits and local artefacts; the Study Gallery - one of the town's most important galleries, housing a large collection of mid-20th century art works; and the Poole Lighthouse - the newest centre for arts, with number of excellent exhibitions, such as contemporary photography and modern, digital art. Festivals and events in the town include the Poole Summer Breeze - the largest beach party, held every Thursday night in the summer, with live music, a fun zone for families, barbecue areas and a spectacular firework display at around 22:00; and the Poole Crescent Dream Machines - where literally thousands of motorbikes gather on the Quay every Tuesday evening during the summer. Poole has excellent shopping facilities and the large Dolphin Shopping Centre is situated in the centre, offering some of the best under cover stores in the town. There are over 100 shops at the Dolphin Centre, including a number of familiar High-Street chains and many smaller, independent specialist shops. 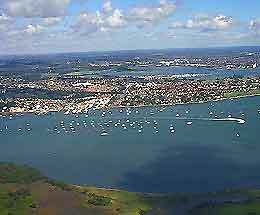 There are numerous towns and cities close to Poole, offering an enormous selection of day trip possibilities. 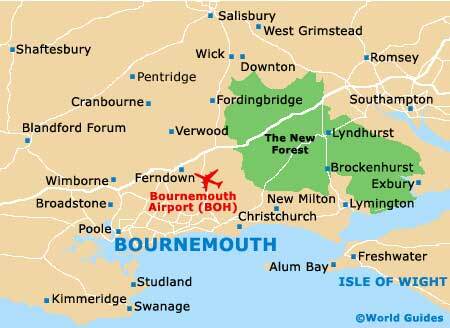 These include Boscombe, Bournemouth, Christchurch, the New Forest, Salisbury, Southampton, Swanage and Wimborne, which are all well worth a visit when staying here. It is even possible to pop over to the sunny beaches on the Isle of Wight for the day, or head to the enormous shopping malls of Portsmouth.